Shakeology is a delicious, nutritious meal-in-a-glass. With over 70 healthy ingredients and low on calories, this is the perfect complement to any weight loss or fitness program. It is filling and satisfying and will help you slim down and get fit while providing you with essential vitamins and nutrients. It is a no-fuss, easy to prepare shake that comes in 6 amazing varieties: Greenberry, Chocolate, Vanilla, Strawberry, Tropical Vegan and Chocolate Vegan. This power meal can fire up your metabolism, improve your energy levels and help you lose inches and pounds. This healthy meal in a glass is a solution to help you get past plateaus and into fat-burning mode. Shakeology is a catalyst for changing your body. The Shakeology 3-day cleanse is an innovative way to use Shakeology as a cleanse. It’s pretty simple to follow. Three Shakeology shakes a day, three fruits, 2 cups of green tea and a salad with lean protein for dinner. All you do is simply have one Shakeology every 3-4 hours followed by an evening meal of a salad with 3-5 ounces of protein such as grilled chicken or fish. You should also use 2 tablespoons of a healthy oil with your dressing or if you are using salsa add the healthy oil to salsa and mix until completely incorporated. You may use your three fruits either as snacks or added them to your shakes. There seems to be another way of doing the cleanse without the fruit and there is another one without the tea but with the workouts I do I think the added calories from the fruit will help me. The morning you start the cleanse be sure to weigh yourself and take your measurements. You will want to measure 2 inches above the belly button, at the belly button, and 2 inches below the belly button. If you can include your body fat that is great! Click here to learn more about body fat from Nerd Fitness. 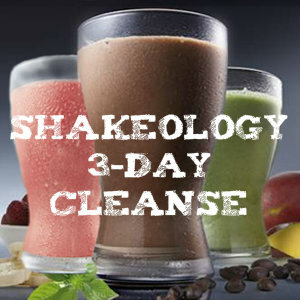 The Shakeology 3-day cleanse will not deplete your body of vital nutrients like other cleanses can. It does not require you to do it days on end, some cleansing diets can last up to 30 days and that’s just not healthy to me. Shakeology comes in a variety of flavors, and best of all, it’s made from the finest whole food ingredients found around the world so it is a perfect way to jump start your way into clean eating. Update 2014: The Shakeology Cleanse has mixed reviews due to the reduced caloric intake. In my honest opinion you should NOT do this cleanse while following a workout program. I would do this the week prior to beginning a new workout as a jump start, since there are not enough calories being consumed to support an intense workout. I also still use almond milk in my shakes when I do this cleanse now. I prefer the consistence of the shake with the almond milk and most unsweetened almond milks only have about 35-65 calories, per cup, so feel free to add some. 3 SHAKEOLOGY Shakes per day (blended with water and ice – no milk, almond milk or soy milk) *See my update above about this. IMPORTANT NO DAIRY (no almond, soy, or rice milk) & NO EXTRA SUGARS! *See my update above about this. If it’s not on the list, don’t eat it! Some people who have done the cleanse found that having the salad for lunch instead of dinner gave them a mid-day energy boost. Feel free to play around with the order that you have things to fit into your daily lifestyle. Most people will kick their sugar cravings to the curb with this cleanse, lose excess water weight and jump start their clean eating goals. This isn’t a miracle pill…those don’t exist, so please don’t use this as one. You also need to maintain a lifestyle of clean eating if you want to maintain the results you achieve with this 3 day cleanse. If you are interested in starting this cleanse and would like to know how to order Shakeology please contact me or visit my Facebook page, where you can check out the tab for programs I’ve used and order your Shakeology or message me for more details. For more information on my personal experience with this cleanse, please read the blog posts below. 1. How many calories per day? 800 to 1,100 calories per day *Update: This was taken from Beachbody when the cleanse first came out and is way too low! Please consume at least 1,200 calories per day. You can add extra lean protein to your salad or snack on some fresh raw veggies during the day if needed. 2. How often can I do the Shakeology 3-Day Cleanse? That’s up to you. I would do this if you stop eating clean due to the holidays and want to jump start getting back on track or if you hit a weight loss plateau. 3. Should/Can I still do my workouts during the cleanse? It depends on the individual but I highly recommend that you do not. You’ll have less energy than normal, so consider doing it during a recovery week if you can’t wait until you end your program. 4. Can I do a 1-day or a 2-day cleanse instead of a 3-day? Yes! Some people will see results with one or two days. I would recommend against continuing the cleanse for more than three days. 5. Should/Can I take other Beachbody® supplements during the Cleanse? You cannot use the Results and Recovery Formula™ as there is too much sugar/calories – Supplements like Omega-3 and multivitamins are not necessary, but won’t hurt either. *I did not receive any money to promote this item, although I am a Team Beachbody Coach. Information here comes from the Shakeology site/brochures or is my personal opinion. I love the Chocolate Shakeology with banana! After the cleanse what do I do? What can replace the meals with? Do I continue drinking tea? What to do in order to keep the weight of??? After the cleanse you would want to stick with replacing one meal with Shakeology (if you like it and want to stick with it). You would want to eat “clean” for your other meals through out the day. As for the tea, you could continue drinking it if you would like. Some people really enjoy green tea (I am not one of them) and you can even have it iced as the warmer months approach. As for the keeping the weight off, that will come with clean eating, making sure you drink plenty of water through out the day to hydrated and making sure you stay active. Can I just have two shakes a day or is it vital that I have 3? Can I still add chia seed into my shakes while on the cleanse? Hi Chelsey, Thanks for stopping by the blog and commenting! The Shakeology cleanse is a few years old and I honestly think you are fine with 2 shakes instead of three. Just make sure that you have your protein and veggies. I also don’t see any harm in adding chia seeds to the shakes. In all honesty, I’m not really a fan of cleanses like this, but I think a modified version of it like this is good as a way of resetting the system and getting back into healthy habits. If you have any other questions please let me know!